I’d always pronounced it fell-awful, or, when I was feeling particularly clever, feel-awful. But when I enter *Al Salam Bakery Deli & Restaurant, hostess Ain gently corrects me: it’s roughly fail-aye-fell. The point is it’s a truly authentic Lebanese place, where my $8 sandwich features large, freshly grilled falafel balls that are light and aromatic, not the dried-out kind one often encounters. 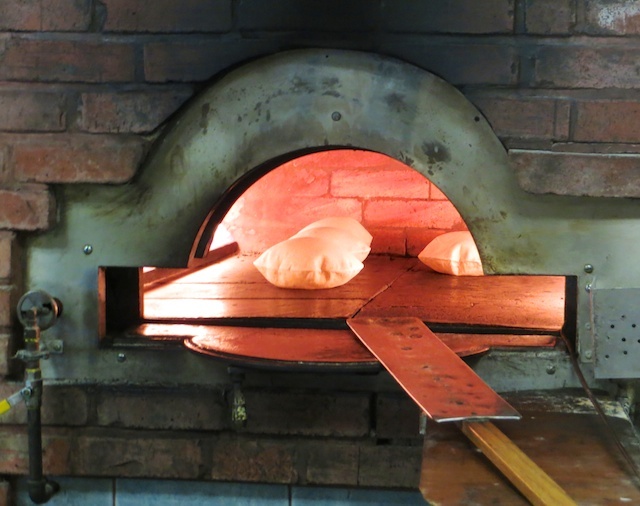 What’s equally good is the enveloping, fresh pita; you can watch them coming off the bakery line in the back of the restaurant. 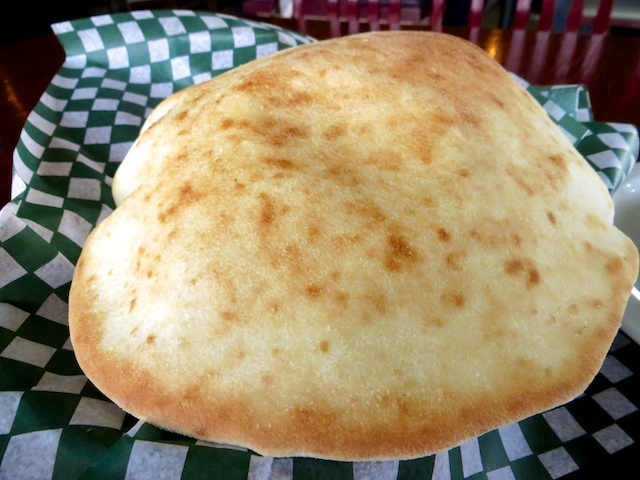 In fact, I finally follow the lead of regular customers who are ordering baskets of fresh pita—large discs of dough that are placed in a pizza-like oven till they puff up. I dip the resulting hot, slightly golden “bread” in some house-made hummus. But honestly, this soft, chewy treasure is good enough to eat on its own. 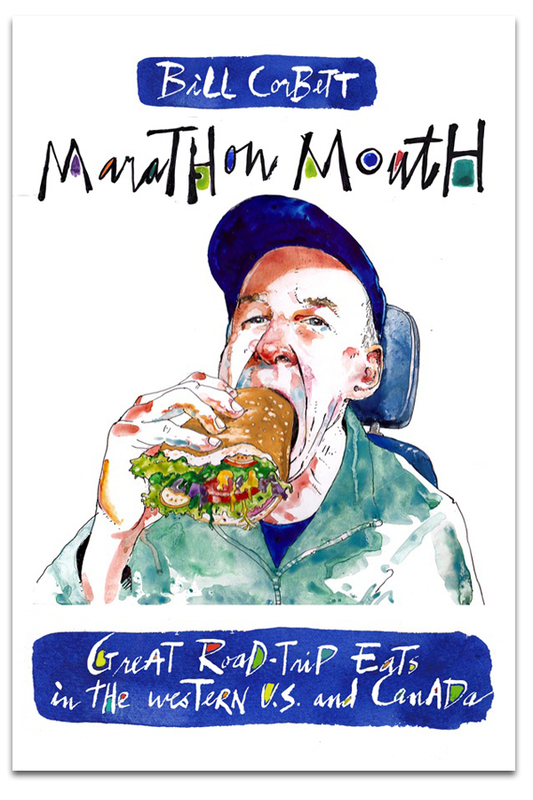 It’s easily the best pita I’ve ever eaten. Al Salam is half deli—where you can buy bags of fresh pitas and other Lebanese foods and watch sandwiches and plates of shawarmas, kebabs and falafels being assembled. The other half is a sit-down restaurant, with a little brick wall in between displaying hookahs for sale. 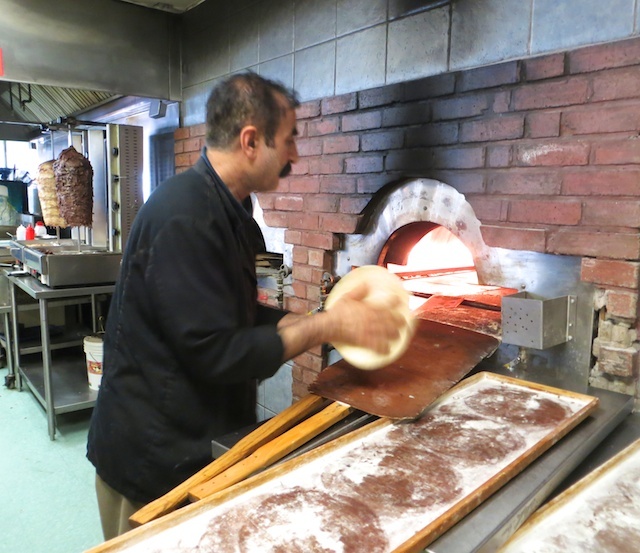 Edmonton’s real little Lebanon district is in the northeast neighbourhood of Rosslyn, where you’ll find two strip malls dedicated to all things Lebanese, especially food. There’s Paradiso Pastries, which sells honeyed baklava and knafeh (a syrupy cheesecake) by the kilo. A couple of doors down, Elsafadi Bros. Mediterranean Market carries good olives, cheeses and inexpensive produce (55 cents a pound for bananas, $1 a pound for red peppers). A few blocks to the east is Cedar Sweets and Jomha’s Halal Meat & Deli. 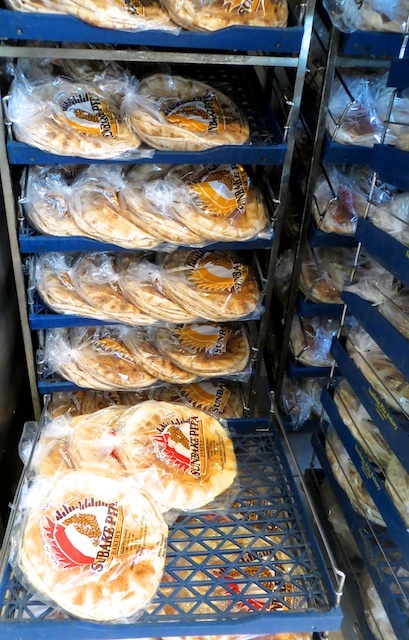 But my principle pilgrimage is to Sunbake Pita Bakery, a family run business that bakes great, inexpensive pitas (some 3,500 an hour). They’re so fresh I can still see condensation in the bags they’re sold in. Behind the counter, Sunbake also makes (mostly takeout) little meals like cheese, spinach or zatar pita pies for the ridiculous price of about $3. 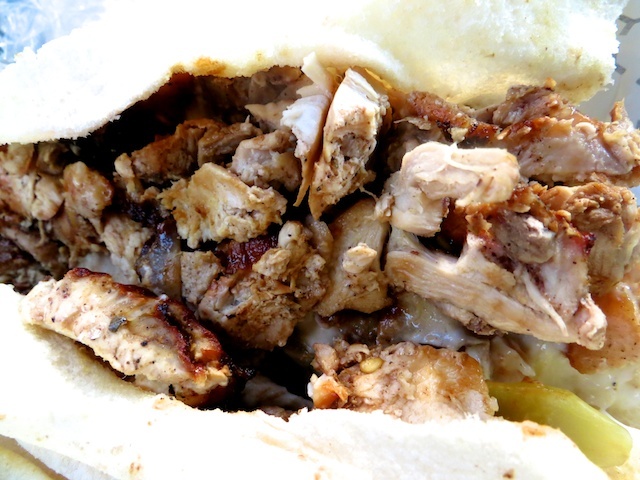 For a few bucks more, I get a heftier shawarma loaded with chicken sliced from a rotating spit. The chicken’s a tad dry but is more than offset with a thick blanket of garlicky tzatziki sauce and some pickled veggies, all wrapped in a wonderfully chewy pita. With a Middle Eastern soundtrack in the background and Arabic conversation all around me, I’m momentarily transported away from this never-ending winter. This entry was posted in Alberta, Alberta restaurants, Edmonton and tagged Lebanese food Edmonton on April 14, 2014 by bcorbett907.